From left are: back row, Randy Sarvis, Wilmington College Director of Public Relations; WC students Eric Lundquist, Felix Maurer and Niklas Martensson from Sweden; front row, WC students David Bogaczewicz and Ludwig Lance from Norway, Ipsi Castillo from Costa Rica, and Clinton-Massie High School student Elisa Muller from Germany. 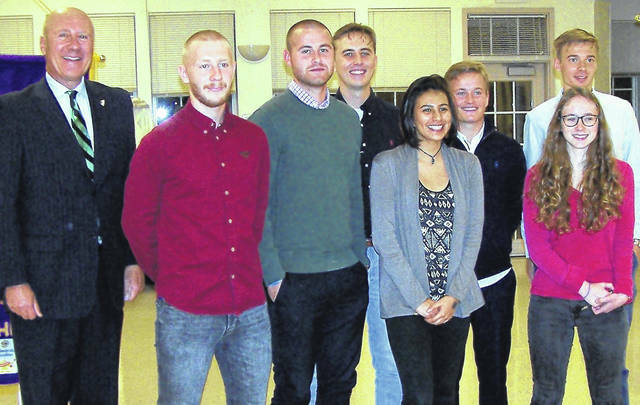 WILMINGTON — The Wilmington Lions Club hosted six international college students and one high school student at the club’s meeting Monday night, Oct. 15. Wilmington College Director Randy Sarvis introduced the college students — from Sweden, Norway and Costa Rica — and Lion Kathey Carroll introduced the Clinton-Massie student, who is from Germany, to the audience. The students shared where they are from and information about their families, how they decided to attend our communities’ educational facilities, and their knowledge of Lions clubs in their home countries. They all expressed appreciation for opportunity to join the Lions for the evening.